Pinaki is an small and unhabited atoll in the Pacific Ocean, part of the Tuamotus. Contrary to a typical atoll, Pinaki’s lagoon remains very shallow. Atolls take millions of years to form: the original volcanic island, surrounded by coral reefs, slowly sinks into the ocean, leaving only a necklace of cays or motus around its original center. The amount of water that can get inside the lagoon also influences the island’s geological evolution. The Western pass cannot be used by ships as it’s completely filled. Elsewhere on the island, several sand dunes up to 10 meters high have formed in recent years. Pinaki was first visited in 1767. Even then, it was uninhabited, even though there were traces of occupation – reservoirs and huts. On satellite imagery, one can also see coconut plantations and a few houses. 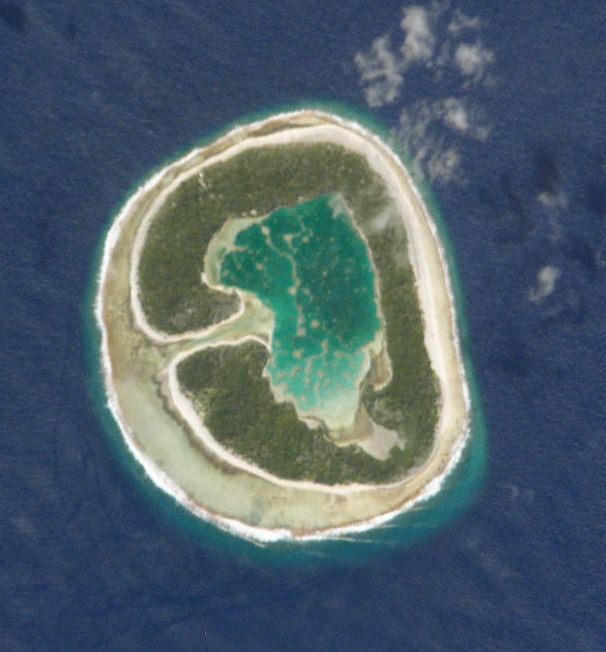 Like many small atolls in the Pacific, Pinaki is probably used as a remote plantation or temporary residence for nearby villagers. Wikipedia mentions that a woman lives on Pinaki alone and permanently, she is referred as Tristan Westlon, but no other source confirms it. 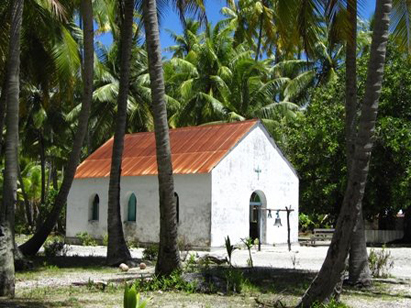 Oddly enough, there is also a church on the island, which seems to confirm it’s often visited but that lack of resources and freshwater make it difficult to inhabit. Hello, how can I contact Tristan Westlon, the woman that (maybe) lives on Pinaki please? Also, how does one contact anyone on Nukutavaki for possible accomodation? I wish I had more information but there’s very little out there regarding that mysterious woman. Please let me know if you find anything. Regarding Nukutavaki, there are very few accomodations on the island, you might be luckier getting information from the nearby Gambier group, or from the Tuamotu administration in Rangiroa. Did anyone manage to get any info on Tristan Westlon (or even see her in person)? If yes, is there nay way to contact her? Thanks for stopping by. To answer your question, nothing came up regarding that person. Looking at the Wikipedia page and its history, whoever added that bit of information didn’t source it. For all we know, it could be a prank, and nobody by that name – or nobody at all – lives on Pinaki.